Avocado Green Mattress Reviews - Is It a Good Mattress? Instead of using polyurethane foam, chemical adhesives, or artificial fire retardants, Avocado Green Mattress lets you sleep on eco-friendly materials. Featuring non-toxic chemicals and eco-friendly materials like New Zealand wool, organic cotton, and 100 percent natural latex, the company behind Avocado Green Mattress is on a mission to help safeguard your health and protect our planet. In addition, the website reports these mattresses contain “no polyurethane foams that could break down, no memory foams to off-gas, no chemical adhesives between the comfort layers to emit chemical odors, and no chemical flame retardants to endanger your health.” In fact, everything that’s contained in their mattress is disclosed on their product page. Additional Avocado benefits include up to 1,414 pocketed support coils that provide pressure-point support, handmade button tufts, and affordable prices. You might not exactly be classified as an ‘eco-warrior,’ but you still want to support companies who are focused on ethical and sustainable business practices—while also getting a good night’s sleep. But can a CA-made Avocado Green Mattress tick all your boxes? Here, we’ll walk you through what we learned during our research, including feedback from industry professionals. In a few minutes’ time, you’ll be able to answer this key question. How Does the Avocado Green Mattress Work? Weight is between 59 and 122 pounds, depending on the model, although each features two heavy-duty upholstered handles on each side, which are hand-sewn for a tight fit. According to the company, this makes moving or adjusting your bed a breeze, and they won't cause your sheets to bunch out. 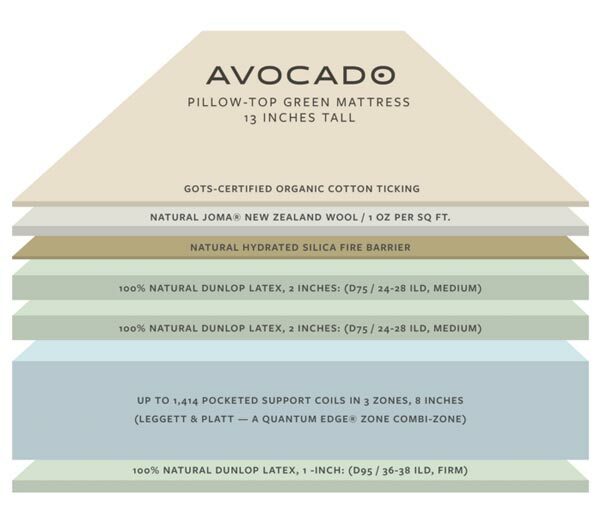 From a safety perspective, Avocado’s mattresses use non-toxic, chemical-free fire retardants made of naturally hydrated silica and New Zealand wool, while exceeding all federal flammability and CPSC standards. Their products are also naturally resistant to House Dust Mites (HDMs). Furthermore, their manufacturer's latex is certified by the eco-INSTITUT to be free from "volatile organic compounds (VOCs), persistent organic compounds, heavy metals, pesticides, formaldehyde, and phthalates," the ticking uses Global Organic Textile Standard (GOTS) certified cotton, and the button-tufted mattress covers are made with premium, certified organic cotton. How Much Do Avocado Green Mattresses Cost? Shipping is free, although it can take seven to 10 business days to make your mattress, plus up to nine business days to ship your mattress via FedEx. For an additional $99, customers can choose in-home delivery and setup, which also includes removal and recycling your old mattress set if you prefer. All mattresses come with a 100-night trial, with no fees or pick up charges, along with a 25-year warranty against defects in material and workmanship. The first 10 years provides full, non-prorated coverage, while years 11-25 provide limited, prorate coverage. On the other hand, pillows come with a 30-day refund policy, less S&H charges. In order to speak to customer service, you’ll need to utilize their online chat or contact form. What Can We Learn from Reviews for Avocado Green Mattress? 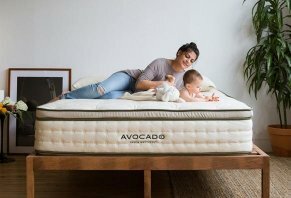 From a professional perspective, Avocado’s mattress seemed to have mostly positive feedback from sites like The Sleep Judge, The Sleep Sherpa, and Mattress Clarity. Sleep Judge mentioned that the mattress was firmer than many of the competitors she’d tested, although it featured a high degree of edge and overall support, minimal motion transfer, and average heat transfer capabilities. In fact, the only downside she noted was that you might be able to feel the buttons through bedding, although she emphasized it was minimal. In the end, she recommended an Avocado Mattress for those interested in improved airflow, support, and spinal alignment, as well as those who want relief from back pain and excess pressure. But she felt it might not be the best option for those that prefer a higher firmness level, or those who don’t carry much weight. On the other hand, The Sleep Sherpa noted that the Avocado Mattress has quite a lot of bounce, but they felt the company did a phenomenal job of blending coils and tufting, as well as featuring all-natural materials, high-quality construction, and durability. Finally, Mattress Clarity recommended the Avocado if you’re looking for a natural, breathable mattress that will last a long time; one that features a lot of bounce and resiliency, or if you prefer the feel of foam but not the accompanying sinking feeling. From a customer perspective, we only encountered two Amazon reviews for Avocado’s King model, where it held an average rating of five stars. Both customers complimented its lack of smell, comfort, and natural materials. Over the years, the HighYa team has researched many of the most popular direct-to-consumer mattress companies, including top-tier competitors like Tuft and Needle, Leesa, Casper, and Purple. And what have we learned after all this investigation? There are really only three main differences between each one: The number of layers they feature, the materials they use, and their price. And often times, the best option for you depends on the emphasis you place on each of these differences. For example, companies like Tuft & Needle, Casper, Leesa, Zenhaven, Novosbed, Yogabed, Lull, and Nectar offer all-foam mattresses without coils or pocket springs. So, if springs are important to you, you’re limited to brands like Sapira, Saatva, and Avocado. On the other hand, if you’re focused primarily on 100 percent natural materials, Avocado and Zenhaven might be among your top picks. Although they’re also among the most expensive, so they might rank near the bottom if price is one of your most important factors. This is why we listed ‘preferences’ as the first place to start in How to Buy a Mattress Online: Save Time & Money by Knowing What to Look For. The next thing you should take a look at is the company’s online customer reputation, and whether or not you encounter any frequent problems or complaints. Finally, reach out to any companies that make it to your shortlist and ask questions. "Are they friendly? Do they seem knowledgeable? Are they willing to guide you through the selection process?” What you experience before you’re a customer is likely what you’ll also experience after making a purchase. Based on what we learned during our research, Avocado’s mattresses seemed to have a mostly positive—if not somewhat limited—online reputation among consumers and professionals alike. They’re also one of the only direct-to-consumer companies that focus squarely on creating completely natural, yet luxuriously comfortable, mattresses, with standard and pillow-top models. In our opinion, the company’s website does a great job informing prospective consumers; they even have an in-depth buying guide. In it, the mention that their standard mattress rates as a seven on the firmness scale (suited for back and stomach sleepers, lighter individuals, and growing children), while the pillow-top is at a six (best for side sleepers, heavier individuals, and those in search of pain relief and back support.). So, if you’d prefer something on either side of these numbers, Avocado might not make the top of your list. Another big consideration is that you’ll pay for Avocado’s top-quality materials. The bottom line is that purchasing a mattress is an intensely personal process. So, while everything we’ve outlined here can help move you in the right direction, the only way to know if it really works is by sleeping on it. In this regard, Avocado provides free shipping, a 100-night trial, and free shipping and returns, so you likely don’t have much more to lose than a bit of your time for giving them a try. For supposedly being a 7/10 on the firmness scale, it feels more like a 9. If you try to sleep on your side like I did, you'll more than likely wake up with pain in your ribcage (like I did), more back pain than usual (like I did), and a very unpleasant night's "sleep," if I can dare call it that. The creators of the Avocado Mattress must have all based their comfortability rating in comparison to sleeping on the floor with a pillow underneath yourself. Because that is exactly what it feels like. For the price of this bed, and it's (organic) marketing (c'mon, you aren't fooling anyone with that garbage now are you? ), you'd be better off to get a Tempur-Pedic because the ~$1600 price tag is not worth it. Write a Review for Avocado Green Mattress! Does Your Bed-In-A-Box Mattress Need a Box Spring, Bunkie Board, or Foundation? Do Online Mattress Companies Deliver Better Value?